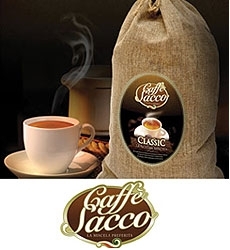 Caffe Sacco uses the finest Arabica beans roastedto perfection to achieve excellence and superior quality. Espresso Beans regular and decaffeinated, Espresso Pods, Colombian Supremo beans ground, Custom Blend,Dark Roast, Flavored Coffees, Specialty Coffees -Kenya AA and Sumatra. Sales and service of coffee equipment by Certified Technicians. Installationand demonstration available...ask about our free service.